Stop and take a look at your garage floor for a minute. Is it ridiculously dirty, stained, damaged, ugly and unsightly? Isn’t it time to protect your garage floor and your investment? With our high quality Garage Floor Coating Systems, we can provide your garage with a decorative and durable stain resistant finish that will last and increase the value of your home for less than you may think! Our garage coatings are NOT a “paint” or do-it-yourself, low quality epoxy system like you may find in the big box stores. 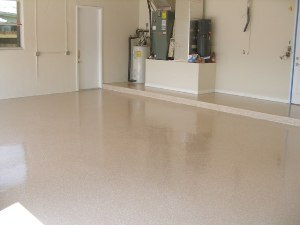 Instead, our Garage Floor Coatings are professionally formulated, 100% solids epoxies, polyurethanes and polyaspartic resins that are engineered to be tough, good looking, and long lasting for years to come. A garage floor should never be neglected! Over time cracks that seem small can start to spread and cause further erosion and damage to the surface. Don’t wait until it’s too late!